Imagine, music that moves with you as you walk through your house. Pause a TV in one room and hit play when you reach another. The audio/video possibilities for your home are limited only by your imagination. Klepps will help you pick the best products that meet your needs and budget. We’ll custom design a system for your house or business and provide professional installation and service. Life used to be quite simple. You put a record on the turntable and listened to it in the living room. The evolution of the Walkman, Discman and iPod helped us take our music on the go — but only while wearing headsets. Today’s audio technology allows you to listen to your music in any room in the house — even from a record player — without headsets, static or interruption. 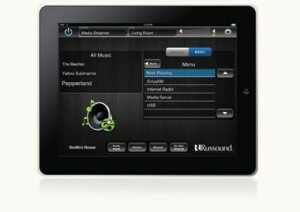 With a centralized or single zone system — music can be delivered to any room in the house from a central command center. Pick your input (turntable, radio, digital music library, cable TV, etc.) and select one or more rooms to receive the same playback. Speakers in these rooms can either be hard-wired or they can use wireless Bluetooth technology. Never miss a beat of your favorite song as you do errands around the house! With a de-centralized or multi-zone system, people in every room in the house can select different audio playback, pulling music from a variety of sources. One parent can listen to a Podcast in the living room while the other listens to the game while cooking dinner. The kids can listen to their favorite bands in their own bedrooms. When dinner is ready — everyone can be paged to wrap up and head to the dining room. No matter what your video source (satellite, cable, DVR, DVD/BluRay, etc. ), Klepps can help configure your system so that you won’t be tied to a single screen while enjoying your favorite programming. Pause in one room, resume in another. View different inputs from different rooms. When combined with a wi-fi computer networking system, people in different rooms of the house can videoconference with each other and/or friends and family all around the world. Klepps Audio Systems can fully integrate your audio and video systems with your Home Theater, Security/CCTV and Home Automation Systems. Commercial applications such as boardroom and teleconferencing suites are also available.